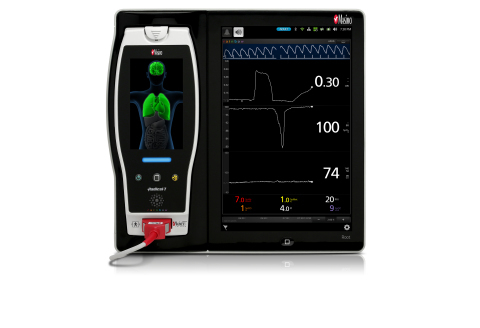 NEUCHATEL, Switzerland--(BUSINESS WIRE)--Masimo (NASDAQ: MASI) announced today the findings of a study recently published in Anesthesia & Analgesia in which researchers at the University of Groningen, the Netherlands, and Ghent University, Belgium, investigated the ability of Masimo ORi™ (Oxygen Reserve Index) to show trends in oxygenation in the moderate hyperoxic region (partial pressure of oxygen in arterial blood [PaO2] in the range of 100 to 200 mmHg).1 ORi is available outside the U.S. and is intended as a noninvasive, relative indicator of a patient’s oxygen reserve during moderate hyperoxia. ORi can be trended and has optional alarms to notify clinicians of changes in oxygenation. Masimo announced the results of a recent study investigating the ability of ORi™ to show trends in oxygenation in the moderate hyperemic region.